As parents, we can make things worse with our kids instead of better when we deny how they are feeling. "You can't be hungry, you just ate lunch"
"My shoes are hurting my feet." "No they aren't, put them back on your feet." Can you see the problem with both of those examples. Can't you just hear the arguments starting. "But mom, I am hungry." "You just ate, you don't need any more food." "I know but I am still hungry!" "I just made you dinner and you said you were full." And on and on and on.... Arguments and temper tantrums ensue. Funny, there was no arguing or tantrums until WE DENIED how our kids felt. When we are constantly denying our children's feelings it makes them mad and confused. This leads to misbehavior. It also causes them to stop trusting their own feelings. 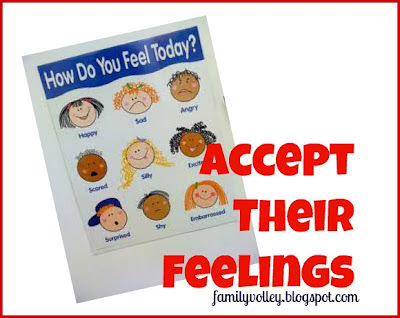 We have to accept our children's feelings. It is how THEY feel. Who are we to tell them that how THEY feel is wrong? When we accept our kids, they feel more respected, more loved and there will be less power struggles because they feel validated and understood. Just like with adults, it isn't so much a solution kids need, as it is to be understood and accepted. So how can we respond? First, we need to think about the situation from their point of view. Put yourself in their shoes. What if when you told your husband you were hungry, he said "no you aren't, you just ate." What if when you were 9 months pregnant you told someone your back hurt and you needed to rest, and they said..."your back doesn't hurt, you have already had 4 kids, you are used to it." What if when you were cold and wanted to wear a coat, your husband said..."you're not cold, you don't need a coat." None of these responses would sit well with us. You can quickly see why our kids get so upset. STOP and think about how your kids feel. When I am hot, I am miserable. I don't want to wear my coat. They are hot and miserable too. A simple comment response works wonders. I used it today. Our daughter came to me to tell me about something her brother had done. She was playing with the baby and he came and took over. Instead of counseling her, or getting on her, or telling her it wasn't a big deal, I just said, "hmmm, really?" Guess what happened? She looked at me, said... "yes he did, he always does that". And then she ran off to play. She just wanted her feelings to be validated. That was the end of it. If I had tried to solve the problem, figure out who was at fault, or said anything else, it would have turned into a "thing". Remember, always accept how your children feel. It is okay to feel frustrated, hungry, mad, happy, excited and/or irritated. Don't always accept how your kids act. Hitting, or throwing a fit because they are mad or frustrated is NOT okay. Try this. Accept their feelings without any strings attached. You will see that it helps with the arguments and power struggles and makes for a happier household. Have you ever told your child they weren't hungry? Will it be hard to hold your tongue and just say "Hmmmm?" Sometimes it's just nice to be heard and that's all that matters. I know there are lots of time when I share something with someone and I don't want him or her to fix it. I just want him or her to hear me out as I know that I am the kind of person who processes feelings aloud. These are good reminders. I am so glad I just stumbled upon your blog. Great stuff! I am your newest follower. Come on by my blog, if you have a chance. We have a lot in common- blogging about kids, college Professors. Groundbreaking. Why in the world have I never considered that I wasn't validating their feelings? I mean seriously. I say to them on a daily basis "no you're not" (fill in the blank). I'm ridiculous as a parent. I can't wait to try this now. Sheesh, after 8 years, you'd think I would have figured this out. But COME ON, after eating dinner and they say they're hungry? It just makes me nothing but mad. Great post! Listening makes people feel validated. Growing up my grams listened to every problem I had, she didn't judge me she didn't give advice she just listened no strings attached. This is hard for me, when people or my kids have a problem I want to solve it but usually people already know what they need to do or they figure it out while they are talking and someone is just listening. Great reminder, I am going to try and just respond with a "really?" what a great reminder this is! Thanks for it! I love this, Heather! I think this happens so often with children, and it's no wonder that they pitch fits!